The natural principles course (short course) Videos demonstrate the natural principles in a woodland setting and explain how we can learn from them for our own happiness, health and wellbeing. Practical exercises to download and complete at home (or in the woods!) will allow you to translate those principles into your own life. 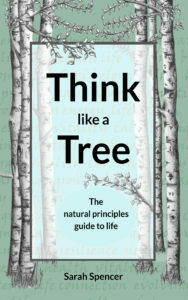 Think like a Tree design cycle course (longer course) The design cycle is a twelve stage process, that offers tools to transform your life in a step by step way. For wellbeing, health, change in livelihood, confidence-building, overcoming a setback, relationships, community, leisure, business and more… Also offers a deeper look into the natural principles and nature’s patterns via videos and downloads. Practical exercises, which build in each module, provide you with a wide range of tools ensure you have the skills to put your life change into practice, and are there to refer to again and again. To register your interest in either course please sign up to the email list.